Beach Lane Books, 9781442412613, 40pp. 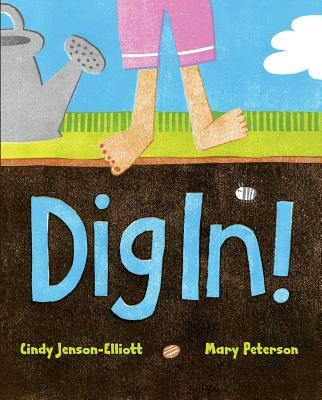 Dig in to this vibrant picture book that celebrates all the surprises found down in the dirt! I dig in the dirt...and find a seed. I dig in the dirt...and find a spider. Explore all of the creepy, crawly, dirty, muddy, green, and growing things that can be found outside in the garden. From pill bugs to worms to leafy green sprouts, young readers will love discovering the muddy garden habitat within the pages of this book—and outside in their own backyards! This sweet and playful celebration of outdoor exploration is a perfect read aloud for story time. Cindy Jenson-Elliott is the author of the celebrated Weeds Find a Way illustrated by Carolyn Fisher. She is a freelance writer for a variety of newspapers, magazines, and educational publishers, as well as a teacher and natural history instructor. She has an MA in education, and she enjoys spending time outdoors in San Diego, California, where she lives with her family. Visit her at CindyJensonElliott.com. Mary Peterson was born and raised in Iowa on a small family farm surrounded by cornfields and lots of animals. Those early years in the company of critters large and small continue to provide inspiration for her art. She is the illustrator of many books for children and lives in Los Angeles, California.